I’m going to make this CAL relaxed and slow – so you will get 3 weekly instalments and, hopefully, will have plenty of time each week to complete the instalment. Ok – are you ready to start? 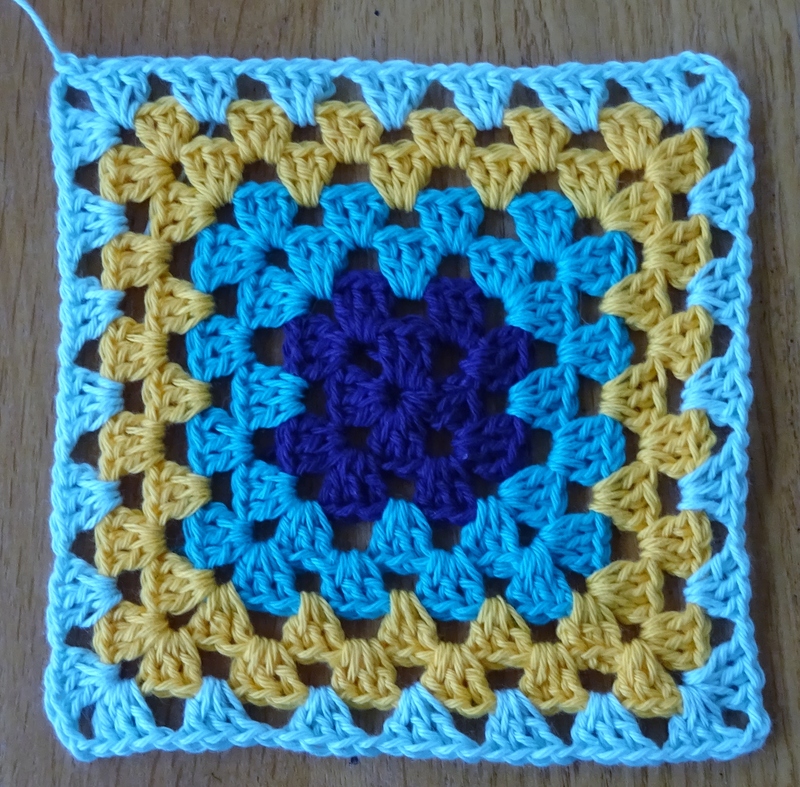 You will need 13 Granny Squares each about 15cm/6″ square. I used a traditional granny square and the pattern I use is written below – but you may use whatever granny pattern you like. Using my pattern and 4ply cotton yarn and a 3mm hook I ended up with 7 rounds (just a little smaller than 15cm/6”). If you are using different weight of yarn you may wish to do fewer or more rounds and, of course, you may choose any colour scheme you want. A quick reminder of my yarn colours: A is Heath (deep purple), B is Sea Green, C is Canary (yellow) and D is Light Pastel Green. Round 2: ss into 2ch-sp, (note for this and each subsequent round: this ss is to position the start of the round in the right place) 5ch (counts as 1tr, 2ch), (3tr, 1ch) into the same 2ch-sp, (3tr, 2ch, 3tr, 1ch) into each of the next three 2ch-sps, 2tr into the first 2ch-sp, join to 3rd st of starting 5ch with a ss. Break yarn and fasten off. Round 3: Using Yarn B, ss into 2ch-sp, 5ch (counts as 1tr, 2ch), (3tr, 1ch) into the same 2ch-sp, *(3tr, 1ch) into the next 1ch-sp, (3tr, 2ch, 3tr, 1ch) into the next 2ch-sp; repeat from * another 2 times (3tr, 1ch) into the next 1ch-sp, 2tr into the first 2ch-sp, join to 3rd st of starting 5ch with a ss. Round 4: ss into 2ch-sp, 5ch (counts as 1tr, 2ch), (3tr, 1ch) into the same 2ch-sp, *(3tr, 1ch) into each of the next two 1ch-sps, (3tr, 2ch, 3tr, 1ch) into the next 2ch-sp; repeat from * another 2 times (3tr, 1ch) into each of the next two 1ch-sps, 2tr in the first 2ch-sp, join to 3rd st of starting 5ch with a ss. Break yarn and fasten off. Round 5: Using Yarn C, ss into 2ch-sp, 5ch (counts as 1tr, 2ch), (3tr, 1ch) into the same 2ch-sp, *(3tr, 1ch) into each of the next three 1ch-sps, (3tr, 2ch, 3tr, 1ch) into the next 2ch-sp; repeat from * another 2 times (3tr, 1ch) into each of the next three 1ch-sps, 2tr into the 1st 2ch-sp, join to 3rd st of starting 5ch with a ss. Round 6: ss into 2ch-sp, 5ch (counts as 1tr, 2ch), (3tr, 1ch) into the same 2ch-sp, *(3tr, 1ch) into each of the next four 1ch-sps, (3tr, 2ch, 3tr, 1ch) into the next 2ch-sp; repeat from * another 2 times (3tr, 1ch) into each of the next four 1ch-sps, 2tr into the 1st 2ch-sp, join to 3rd st of starting 5ch with a ss. Break yarn and fasten off. Round 7: Using Yarn D, ss into 2ch-sp, 5ch (counts as 1tr, 2ch), (3tr, 1ch) into the same 2ch-sp, *(3tr, 1ch) into each of the next five 1ch-sps, (3tr, 2ch, 3tr, 1ch) into the next 2ch-sp; repeat from * another 2 times (3tr, 1ch) into each of the next five 1ch-sps, 2tr into the 1st 2ch-sp, join to 3rd st of starting 5ch with a ss. Break yarn and fasten off, leaving a long tail of about 3m for sewing or crocheting together later. Tune in for the next stage, which I’ll publish in a week. I have a discussion thread on my Ravelry Group here. Please join in and share your progress. 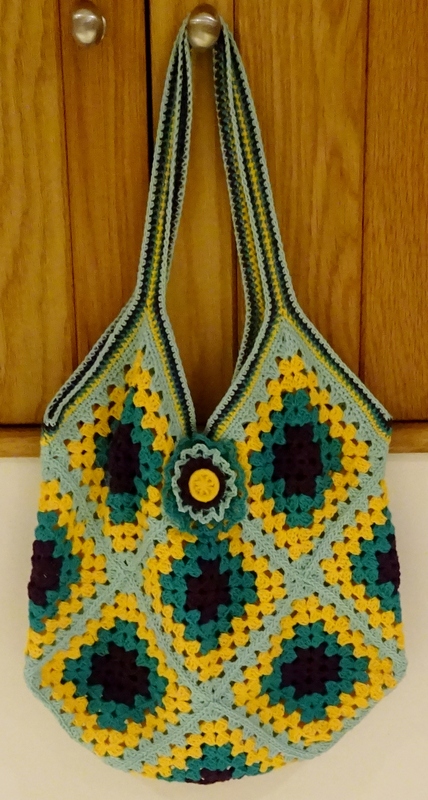 I need a crocheted crochet bag! Carrying it around in a Sainsbury bag all Christmas did not inspire anyone to buy me a craft bag, so I’ll have to make one!